Any show that is billed as ‘the electrifying circus sensation’ demonstrates two aspects of its nature: its commercial success and its artistic hubris. And after ten years of touring there is a danger of a third: creative fatigue. Les sept doigts de la main (The 7 Fingers) is a circus troupe from Montreal set up in 2002 by seven founders to ‘bring a human scale to circus.’ It now has 15 creations and eight touring shows with which it has ‘extended its grasp around the globe.’ The company mixes such diverse circus forms as ‘acrobatics, avant-garde dance’ (whatever that is), ‘acting, physical comedy, music, song, spoken word, interactive video production, live DJ-ing and personal story telling.’ The seven performers (Kevin Beverley, Lucas Boutin, Anne-Marie Godin, Kai Johnson, Yann Leblanc, Harley McLeish and Enmeng Song) are trained in various forms of acrobatics — Cyr Wheel, Diabolo, Aerial Strap, Dance Trapeze, Chinese Pole, Hand to Hand, Hoop Diving and Teeterboard — which represent only the first circus form in the company mix. The others seem to have been picked up on the fly (Beverley is the only one to include dance in his biography). 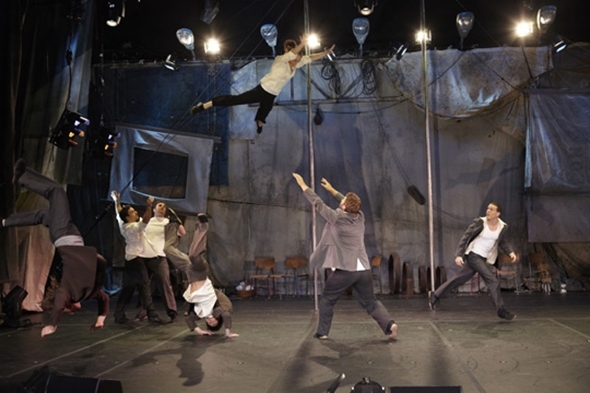 It is surprising the term ‘clowning’ does not feature anywhere in their training for the seven artists are required to keep the show moving with what the art of clowning can do so well: physical comedy, music and songs. The lack of any artfulness between the acrobatic acts of Traces (the piano playing is particularly hokey) is a structural weakness and makes the six men look like an immature boy band — all good-looking and powerfully built — with their one moll. In the creation of Traces, directors Shana Carroll and Gypsy Snider appear to have concentrated first on the acrobatic acts and then strung them together with a strip of narrative to make a show. In the ten years since then circus companies have worked to bridge this creative imbalance (I was impressed with Circa recently) but however revolutionary Traces might have been in 2006 its story line seems dated now: ‘Traces takes place in a makeshift shelter, an unknown catastrophe waiting outside the doors of tarp and gaffer tape. In the face on an impending disaster they have determined that creation is the only antidote to destruction.’ So there you have it, and you can forget about it as soon as you have read it because it bears no pertinent relation to the show at all. The set (conceived originally by Flavia Hevia) is indeed reminiscent of the inside of a makeshift camp with its layers of canvas hanging on the back wall held together with ropes, scaffolding and wires complemented with lights, a few school chairs, a battered upright piano and a dusty plush armchair. It is effective in its suggestion and possibility without the least hint of a circus environment. The theatre announcement is a clever, sardonic parody of the standard mobile phone/recording spiel and touches a rebellious note that makes the audience actually listen to it through their laughter. The show then begins with an eruption of restless energy as all the performers run in, spin, tumble and launch themselves and each other into the air. The youthful exuberance and skill is infectious, but the individual introductions that follow dispel any sense of impending doom and replace it with a saccharine bonhomie that remains for the rest of the show. Most of the present cast has joined the show only this year. Boutin is the old hand with three years experience and Godin has two years. So the majority of the cast of this ten-year-old ‘electrifying circus sensation’ are just beginning to break in their skills on the road. And it shows; the performers make up for a lack of experience with a youthful enthusiasm and bravado that palls. Only Boutin and Song stand out as mature performers: Boutin in his primary discipline of Chinese Pole in which he demonstrates a quality that is exciting in its seeming lack of effort and Song in Diabolo where he mixes dazzling skill with an assured presentation. Godin’s comic skit reading a book in the armchair starts off well but is not sustained, which is how Traces comes across as a whole; after ten years it is past its prime and adding two members to the cast since it was last seen in London in 2009 doesn’t disguise it.